Whether you happen to live in an area where there aren’t very many firework stands or you’re trying to buy during an odd time of the year, locating places to buy sparklers that are both convenient and affordable can be a really large challenge. If you’re looking to buy around the 4th of July or New Year’s Eve, the chances are pretty high that you’ll be able to locate some at a nearby store or one of the temporary tent locations that setup in grocery store parking lots. However, since the demand for sparklers is relatively low during other times of the year, most of the stores that sell them remove them from the shelves to make room for other items that sell more easily. The problem with all the stores packing up their inventory and storing it in the back room is that there are more uses for sparklers than ever before. 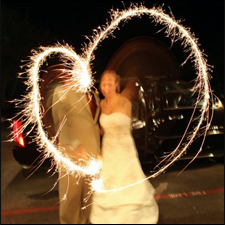 There are many people out there who like to use them at birthday parties or anniversaries, and one of the latest trends has been to use sparklers at wedding receptions in photographs and when the couples makes their getaway. With so many new uses emerging, you may find yourself wondering “where can I buy sparklers during other times of the year”? The good news is that there are a variety of options you have to acquire some sparklers on fairly short notice and have them in your hands in time for your favorite celebration. One of the easiest ways to get your hands on sparklers is to make the trip to a year-round fireworks store. If you’re lucky and live in a state with loose fireworks laws, there is usually a store somewhere that is open all year long to supply people with sparklers and other small firework items. If your state is a little stricter on the time of year that fireworks can be sold, you may need to drive to a neighboring state to find a location. The good news is that the vast majority of states are okay with you transporting sparklers across the border if they’re for personal use, but you should always check your local laws. The easiest way to find a year-round fireworks store is to research on the internet since most companies have a website at this point. You can buy your sparklers on the internet and have them shipped to your door if going to physical store is not a viable option. The best part about ordering online is that you can usually get a better price than buying from a store that has overhead costs like the building and employees. However, the downside is that you will need to wait anywhere from a few business days to a few weeks to receive your sparklers in the mail, so you’ll need to order ahead of time and be patient until they arrive. Probably the easiest and most cost-effective solution to your sparkler problems is to simply buy them ahead of time from your local firework store. After the 4th of July, most firework stores have huge sales where their entire remaining inventory is 50% off. You can easily buy a large supply of sparklers to use as you need throughout the year for a bargain price and eliminate the need to track some down when the need arises. Also, sparklers can last virtually forever if you keep them stored properly; just keep them in a cool dry place. When you have a nice supply of sparklers on hand at all times, you’ll be surprised at how often you tap into them for various parties and celebrations throughout the year.